If you should ever happen to have a human head growing inside you, you may notice that it can be quite difficult to get it out. If you should find yourself born with a human head, you'll need to schedule in some time over the next several months for exercising your neck muscles, in order to prevent the head from wobbling constantly. Even once you've got past the initial stage of getting it to point in the direction you want, it will probably still be ungainly and hard to manoeuvre for quite a while. However, with time and patience, things will most likely improve. In the meantime, you may find that the adults around you consider the constantly shifting weight of your head, as it abruptly bops on and off their shoulders, to be extremely endearing. They may even describe your exertions as "cute". Some may feel a strong urge to surround you with pictures of cuddly animals and to dress you in clothes that say things like "petit bateau" on them. This may seem very odd at first, but try to remember that these people are very bewildered to suddenly have you in their lives, and so may be using things that are familiar to them as transitional objects. In any case, you can take heart from the many people you'll see who have good physical control of their heads. It's important to bear in mind, though, that unfortunately this does not indicate that they have much grip on what's going on inside their heads. Writing this at Lys. It feels very good to be able to write here again. I've become alarmingly dependent on technology, but the fact is that it's dead handy to be able to write in a legible and easily reproducible form. This little computer, which I just got last week - an eeepc laptop, running on linux - seems like it will be very nifty. It's the size of a hardback and weighs less than a kilo. I like its lack of pretension and the fact that it's so reliant on open source software. Also the fact that it was very inexpensive. Thanks to those who commented on my last entry. I was really touched. I haven't had the time or mental space to post since then. 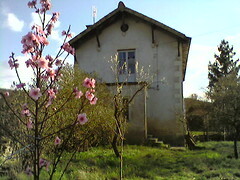 But spring has come here now, finally. The baby has taken to bopping around in my abdomen, particularly in the evenings. A very strange feeling. I took these at Lys this afternoon. Freezing cold day but you'd never guess it from the photos. 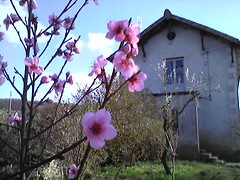 We planted the peach that's flowering last year. It feels so good to have fruit trees again. The porch which you can see in the background has a door with several missing glass panes, and last year a family of swallows seized the opportunity to make their nest inside the house. Although we enjoyed their company, their poop took a lot of cleaning up, so this year we're planning on repairing the glass before they arrive. I'm not usually much into pink but I just can't resist these. I'd thought that today I would write something about my fourth attempt at getting a European driving license. I'd assumed I'd have a good whinge about the arbitrariness of the driving test procedure in France (uncannily similar to that of Ireland), and my own irrational but nonetheless deep-rooted conviction that the European driving test is a crucial rite of passage. 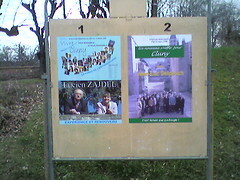 Today in Cluny there was the second round of local elections in order to decide who will be the next mayor, who comes complete with an entourage of 25 or so people. This has turned out to be an interesting enough election that everyone seems to be talking about it. sammywol gave me this year to write about for a "Where was I?" year.